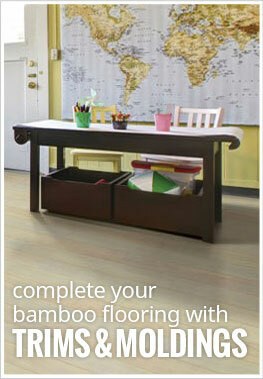 Description - Our Muse strand bamboo flooring has been engineered to be the worry free strand woven bamboo floor. Perfectly suited for the dry climates of the southwest or the high humidity of the southeast, makes these flooring planks great in any space. A DIYers dream, these locking bamboo planks can be installed at, below or above grade. Our muse strand is also unique in that it features flooring strips that are 2-1/2” wide. These strips can be combined with our planks to create a truly unique flooring surface. Featuring our Endura AR UV-Cured Aluminum finish and a lifetime warranty, ensures that your new floor will look beautiful for years to come. Size – Our Muse Strand bamboo planks are 5.59" wide x 72.81" long. Our Muse Strand bamboo strips are 2.56" wide x 72.79" long. Weight – Each plank weighs ~6.5 Lbs. Each strip weighs ~2.89 Lbs. Recommended Uses – Muse Strand bamboo flooring has been used in both homes and businesses and can be found as flooring in offices, in bedrooms, as kitchen flooring, in dining rooms, as basement flooring, in home offices, as flooring for dens, in libraries, as church flooring and much more. Mix Planks and Strips to create a truly custom floor. Two times stronger than oak. Can be install at, below or above grade. I love our new bamboo floor! Great product and shopping experience. I went with the Aged Cordovan color and it looks amazing!